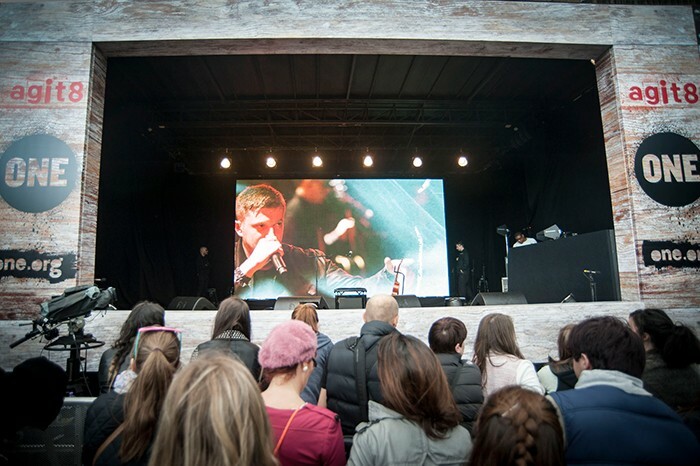 To precede the arrival of world leaders for the G8 Summit in Belfast in June 2013, The One Campaign organized ‘agit8’ – a digital music campaign anchored by a live event held at the Tate Modern on London’s Southbank. The thyree-day event, which featured music stars and well known actors, aimed to inspire a new generation of activists to get involved in the fight to end extreme poverty. XL Video was approached by Mark Ward and Mark Pinder, who had worked with The One Campaign previously, with a view to supplying projection on to the front of the Tate Modern. Initial discussions with XL Video’s project managers, Paul ‘Macca’ McCauley and Gareth Jeanne included covering the Tate’s tower with a projection surface, which led to a test projection in early June using one of XL’s high brightness Barco HDQ-2K40 projectors, together with content from Treatment’s Sam Pattinson. Following the test, it was agreed that the projection on to both the tower and the front wall of the Tate was sufficiently bright that the 40k Lumen projectors could throw directly on to the building’s brick surface. The content for the three-nights of projection was conceived by production company The Found Collective, who worked with acclaimed director Richard Curtis to create an original piece for ‘agit8’. The final work was part-documentary-part-art-installation and incorporated music, speech, video, animation and motion graphics. To ensure excellent visibility on the front of the building, even at sunset on a summer evening, XL Video specified eight of their Barco HDQ-2K40 projectors, ably managed by projectionists Mike Dorrie and Dave Rogers. Content was fed from a pair of Catalyst media servers programmed and operated by Alex Passmore. The building was divided into three sections – two front walls and the mid tower section - each fed by a pair of the Barco units. The final pair of projectors was used to project The One Campaign’s logo on to the top of the tower as a beacon across the London skyline. 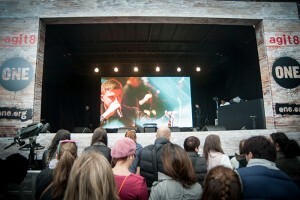 Live music performances took place during the day and into the evening on a riverside stage adjacent to the Tate. Here, XL Video supplied an LED screen made up of Barco NX6 - tech’d by Gavin Precious - together with a further Catalyst media server to handle the content for the LED. "This was a challenging project for us, contending with limited access for trucking, minimal line-up time and getting the projectors placed correctly for the tower" said Paul McCauley. 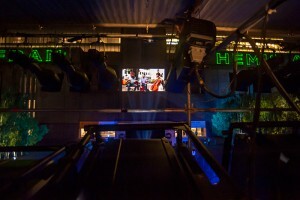 "The Barco 40K projectors – the highest brightness rental units available - really flexed their muscles, so to speak. The brightness and resulting image quality was excellent despite the brown brick projection surface."